Hanoi is the capital of Vietnam, also known as the most important city in many fields, from economy, politics, culture to entertainment and tourism. Coming to Vietnam, Hanoi is definitely a destination you cannot miss. If you don’t believe, join Vietnam Travel Group’s private tour to uncover the beauty of Hanoi, Vietnam. Setting off from Halong or Hai Phong, base on where you are spending your previous vacation, the friendly English-speaking tour guide from Vietnam Travel Group gives you a brief description of the tour before taking you to Hanoi, the famous capital of Vietnam. In Hanoi, there are numerous wonders that represent the magnanimous history and the wonderful culture of the capital in particular and Vietnam in general. But to save you the time and energy, and in order to give you the fullest experience in Hanoi, Vietnam Travel Group will take you to visit the most outstanding ones. Remember to bring your camera to take thousands of impressive pictures, so that you can save an unforgettable memory with you. Your first destination will be the Temple of Literature, which originally built as a Temple of Confucius. There’s no better place in Hanoi to learn about the ancient education of Vietnam. As a complex of relics about the first university in Vietnam, the Temple of Literature is not only a historical and cultural relic but also a place to be visited by many students to pray for luck in examinations and study. The complex of the Temple of Literature relics is currently located within the precinct of 54331 meters square, including many different small architectural works. The Temple of Literature was built in 1070 under King Ly Thanh Tong, a place to worship Confucius, Chu Cong and Tu phoi. In 1076, King Ly Nhan Tong established another Quoc Tu Giam next door to be a university dedicated to the kings and noble families. By the time of King Tran Thai Tong, Quoc Tu Giam was renamed to National Academy and recruited children of civilians with excellent learning ability. Next, you will be taken to Hoa Lo prison museum where the former US presidential candidate John McCain was incarcerated for over 5 years. This is a remarkable relic that represents the cruel reality of the Vietnamese war in the past. Prepare yourself to step into this place. Hoa Lo Prison is a famous historical site and cannot be ignored when coming to Hanoi. Because this place contains a part of the pain of the Vietnamese people during the French colonial rule. Located at number 1 Hoa Lo Street, Hanoi, this area was formerly located in the territory of Phu Khanh Village, Son Nam Town. That day, Phu Khanh was the place to produce terracotta ceramics, so this area was named Hoa Lo village (Hoa Lo means the fire to make ceramics). 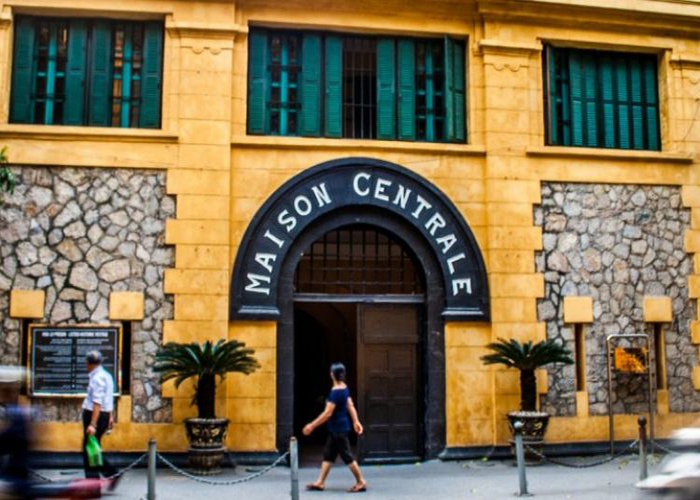 After the French colonialists controlled Hanoi, they turned this piece of land into prison so people often called Hoa Lo Prison, but the name of the prison was Maison Centrale which meany Central Prison or Ha Noi Cabinet Prison. The Hoa Lo Prison at the time was erected to suppress those who confronted the colonial regime, so it was built on a large scale and solidly. In 1896, the prison was built with extremely high requirements in terms of design as well as construction materials, in which all metals, hinges, doors, locks, and so on must be imported from France and had top quality. Around the prison is protected by a 4 meters high stone wall, above the wall is a bottle piece and extremely thick barbed wire, so the prisoner cannot cross this wall. Four corners are four watchtowers capable of covering both inside and outside the Hoa Lo Prison area. Now the prison is no longer kept as compared to its original, but it will be a shame to visit Hanoi without visiting this place. Don’t forget to carefully read the rules of the monument. 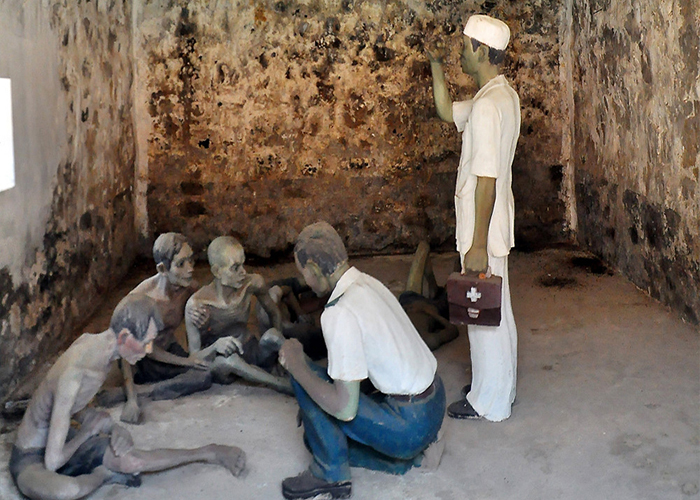 Hoa Lo Prison is known as the earthly hell, this is the most terrible prison in Southeast Asia at the time, and is equipped with horrifying torture weapons and many forms of forced supply and torture. Hoa Lo Prison is a testimony of sacrifice, suffering hardship, the spirit of resilience, and striving before the French colonialists of revolutionary soldiers, as well as a verdict against the barbaric crimes of the France regime. You also have the chance to learn about Vietnam’s 54 ethnic minority people through the extensive display at the Vietnam Museum of Ethnology, which is widely acknowledged as the best in the country. The Water Puppet show that you will enjoy in the evening is also a famous form of entertainment in Vietnam, which is a special factor in the interesting culture of our S-shaped country. In the afternoon, you will be taken to the iconic Hoan Kiem Lake and Ngoc Son Temple before hopping on a cyclo for a one-hour ride around the French inspired Old Quarter. 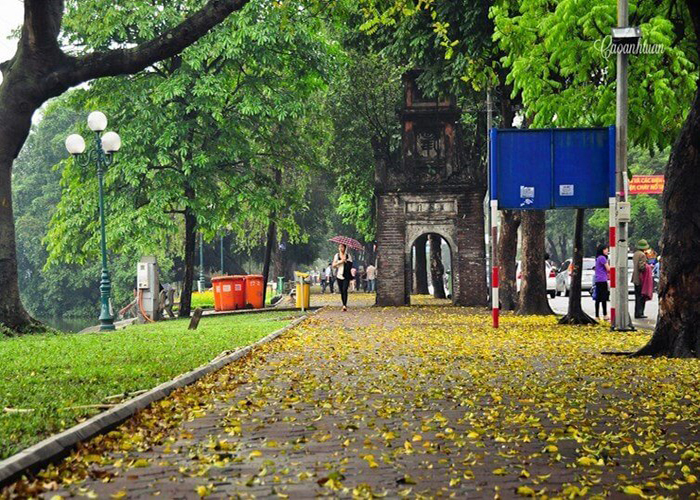 These area might be called the center of Hanoi tourism, which has been attracting thousands of international tourists stopping by every year. 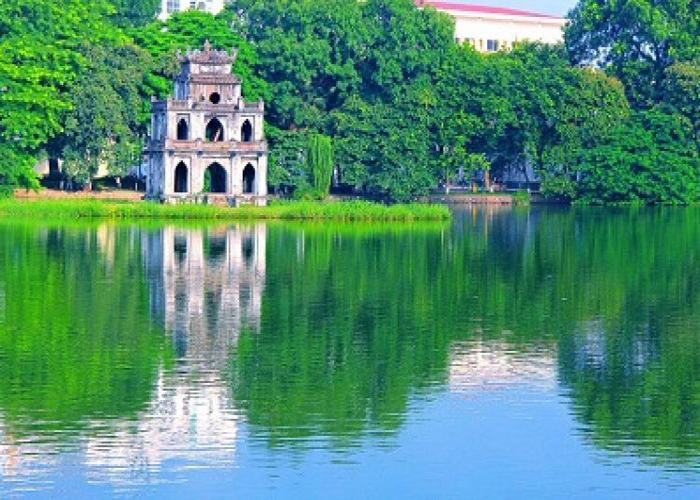 Hoan Kiem Lake, also known as Sword Lake, is not only a cultural and historical symbol of the capital but also a favorite destination for domestic and foreign tourists when traveling to Hanoi. Ngoc Son Temple is one of the destinations not to be missed when traveling to Hanoi. Located on an island in the north of Hoan Kiem Lake, Ngoc Son Temple is connected to the shore by the Thi Huc Bridge painted in bright red color. 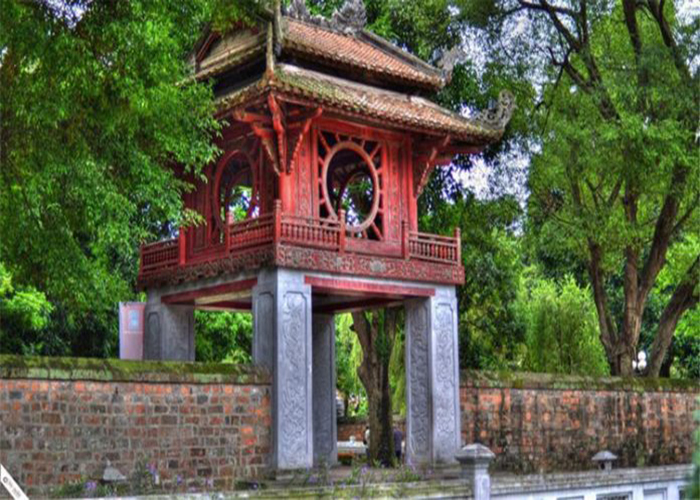 Coming to Ngoc Son Temple, visitors not only admire the architectural work of marvelous time imprinted with nostalgia, watching the whole beauty of Ho Guom but also have the opportunity to learn about the culture as well as the story associated with the history of the temple. With such an interesting itinerary in a day, you have the chance to visit so many wonderful places of Hanoi capital, Vietnam. So why don’t you join us right away? Book Hanoi capital private tour right now! Excited for a trip to Hanoi, Vietnam? Then contact Vietnam Travel Group and book a tour with us right now! With dedicated services, interesting itinerary and a reasonable price, this tour is just perfect for a wonderful day in Vietnam. Vietnam Travel Group is thrilled to serve you in Hanoi, Vietnam. We are looking forward to hearing from you. We wish you a good day and a wonderful vacation in our beautiful Vietnam.